1891- Presbyterian work began among German Immigrants in Irvington. 1896 –Manhattan Park German Presbyterian Church was established in the Presbytery of Newark, drawing on the resources of Bloomfield Seminary. The congregation was chartered with 37 members. The Rev. Otto H. Dietrich was the first pastor. Worship was originally in German language. 1910 – An English language branch of the church was established to cater for the needs of the new generation. Ms. Dorothea J. Lueder (a missionary), was its first director. 1914 –The English language ministry was called “Friendly Center” and it later became affiliated with Calvary Presbyterian Church in Newark and was known as Calvary West Chapel. It became a new church with facility on Smalley Terrace in Irvington in 1915. 1920 – Calvary West Church the first English language branch, had 177 members. It changed its name to Faith Presbyterian Church as an independent (particular) congregation. 1948 – “Manhattan Park” (parent congregation) and “Faith Presbyterian” merged. The newly organized church became known as First Presbyterian Church in Irvington. Membership was listed as 400. Members worshiped at Smalley Terrance. 1954- First Presbyterian Church relocated from Smalley Terrace to Berkeley Terrace (present location) to be nearer Springfield Avenue and the new parkway apartments. 1956- Dedication of the new $150,000 educational unit of what was to be the first of a two stage building program. 1963 –First Church revised its building plans, and worked to provide funds for a church sanctuary. 1964 – Dedication of the new sanctuary on November 22. New building and improvements to the landscaping costed $72,000. The then pastor, the Rev. Herbert Boyer, resigned in 1965. The pulpit was vacant for a year until Rev. Quentin Williams took over in 1966. 1974 – Pastor Williams left. After a year, the Rev. C. David McKirachan arrived. He served in a time of transition and uncertainty. It was post “Newark Riots”, urban flight, and dwindling membership. He left in 1980 to Rockaway Presbyterian Church. 1981-82 – Membership now stood at 130. Rev. Nadina Stevenson and Rev. Howard Bearslee, with Presbytery support shared pastoral readership. They were co-pastors. 1983-87- With mission dollars from the Presbytery, Synod and General Assembly, Rev. Stevenson served from 1983-87. Membership was 115 when she resigned in 1987. The Presbytery considered closing down the church. The Session was dissolved. Presbytery took over all assets. 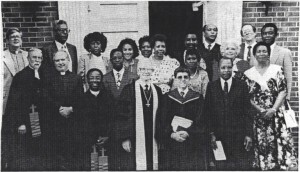 1988 – During this critical year, some 13 members of the former Kilburn United Presbyterian came to First Church at the invitation of Elder Lester Erickson. 1989 –Called by the Presbytery, Obiri Addo arrived on July 2, and was charged to lead a revitalization with an outreach among “new populations.” Membership was 18. 1996 – At the Centennial Celebration of First Church in June 1996, total membership was 268, active membership was 190, average worship attendance was 80. The majority of the congregation was made up of African immigrants from Ghana. 2013 – The pastoral relationship with Rev Obiri Addo was dissolved and an Administrative Commission of the Newark Presbytery was established that eventually worked with a “transition team” of the church to manage the governance of the church. Rev Donald Brown of Caldwell Presbyterian Church was the representative of the Presbytery who acted as moderator for the team up until a session was installed. Rev Denise Kennedy was assigned responsibility for the provision of pastoral care during the interim period when the church was without a Pastor. 2015 – A Pastoral Nominating Committee was elected by the Congregation to lead the search for a Pastor to lead us into another era. 2016 – On May 1st, Rev Lukata Agyei Mjumbe began to serve as our new Pastor on six month, 3/4 time contract. On January 15, 2017 Rev. Mjumbe was installed as the full time Pastor on a three year designated term. 2017 – The church celebrated its 25th Annual Harvest Celebration with the theme, “One People! One God! One Destiny!” The Celebration achieved a record high fundraising goal in support of a major church renovation projected to be completed in 2018.